Order your own copy of New California online through our website today! Don’t let miles of scorching hot desert and irradiated wasteland fool you. New California is a land of opportunity, a place where your dreams can come true. Sure, you might have to battle a Mirelurk Queen or run from a Super Mutant Behemoth from time to time, but what’s that compared to the piles of loot you can wring out of the remnants of the world before the Great War? 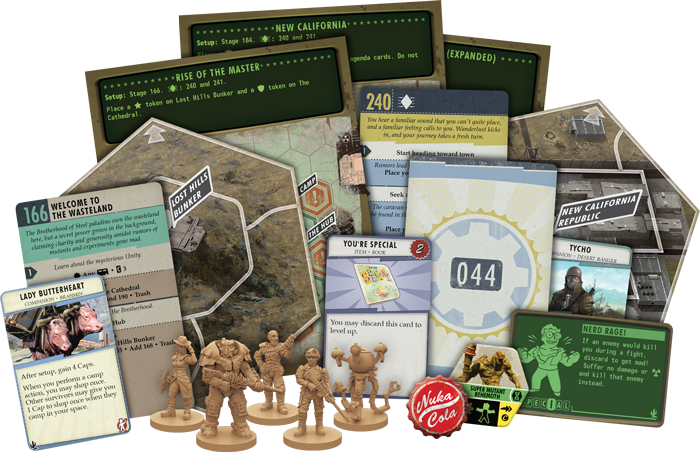 Now is your chance to explore this coastal jewel and see everything it has to offer: the New California expansion for Fallout: The Board Game is available now online through our webstore! Seize the opportunity and make your way in the wasteland today. Folks in New California like to do things a bit differently than other wastelanders. 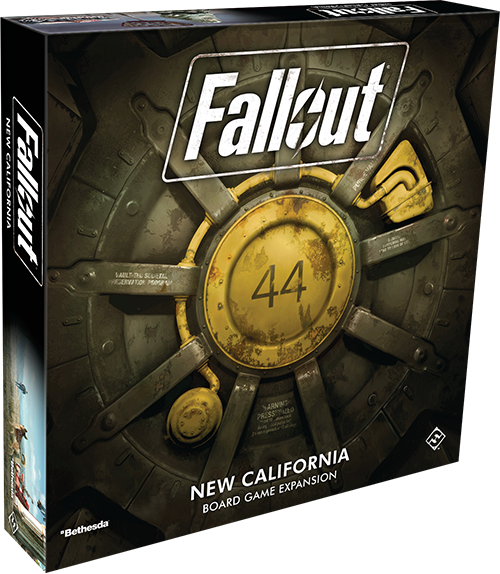 For starters, they prefer the wide open spaces of a large wasteland that only the twelve new map tiles included in New California can provide. Not only do these tiles give you the chance to explore New California in all its glory, they can also add a bit of elbow room to some of the locations from the base game. These new tiles can be seamlessly incorporated into The Capital Wasteland, The Pitt, The Commonwealth, and Far Harbor for expanded versions of these scenarios that provide even more wasteland excitement. The post-nuclear landscape of Fallout isn’t the only thing that’s changed in New California, either. 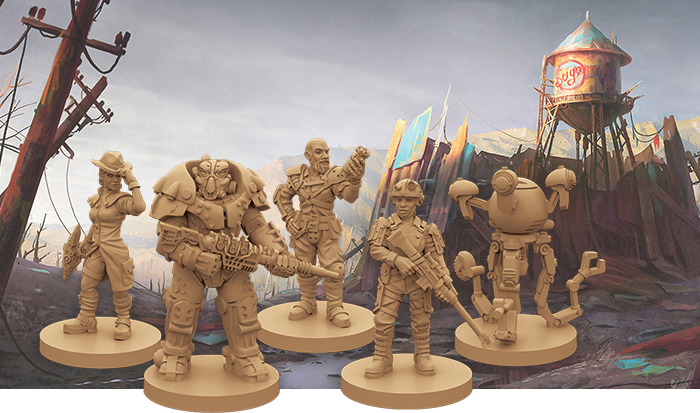 The locals aren’t the traditional type and five new survivors are free to tackle the wasteland on their own terms. If you’re a real loner, you could be a Gunslinger, roaming around the west with nothing but your Trusty Sidearm for company. But if you’re feeling truly rebellious, why not stop waiting around for your masters to come home and strike off on your own as a Mister Handy? That Modular Exoplating is sure to come in handy out in the wilds of the wasteland. No matter who you choose to be, there are plenty of other ways for you to be S.P.E.C.I.A.L. in New California. Seven new perks help set you apart from the everyday wastelander and give you your own unique abilities. 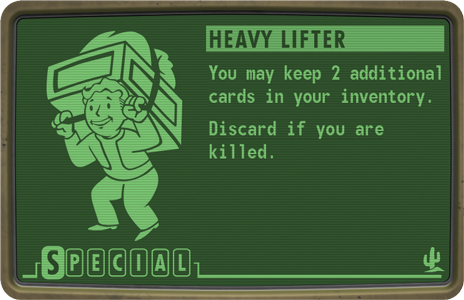 For instance, you’ll be the envy of New California as you display your great strength as a Heavy Lifter, carryimg two additional items around the wasteland. As fun as it may seem to keep all the loot and glory for yourself, however, there are times you may need to band together with your fellow survivors and work for the common good. New Californians look out for each other, so can’t you lend a helping hand to the village of Arroyo in a new cooperative scenario? Working together to help the villagers overcome a drought and the nefarious Enclave is sure to make you feel pretty good about yourself, trust us. 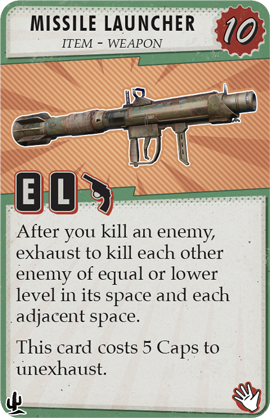 And, if it doesn’t, at least you’ll have the chance to use a Missile Launcher. If “helping your fellow wastelander” and “doing the right thing” aren’t exactly up your alley, well, you’re sure to be excited by the loot to be had in New California. This expansion adds 26 new loot cards that you’ll want to collect before anyone else can get to them. 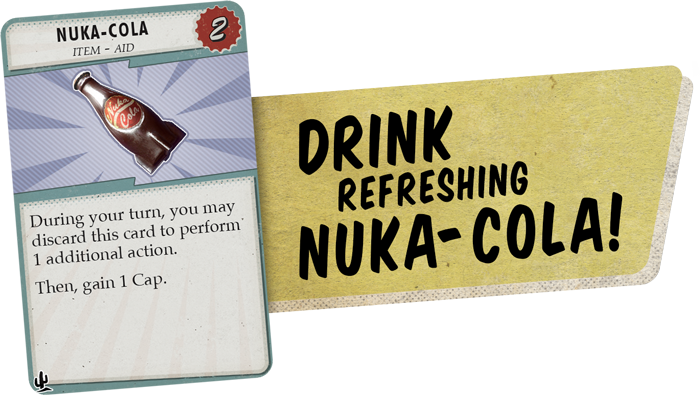 For example, Nuka-Cola might have been a common sight before the bombs fell, but now it’s a precious commodity. 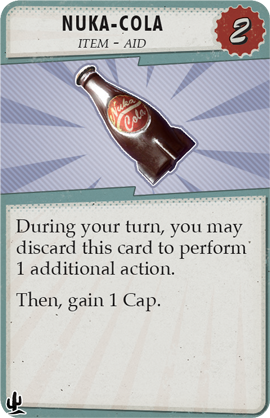 Whether it’s the refreshing taste or the fact that it’s been laying around for at least a century, this beverage gives you an additional action to perform during your turn and a bonus cap to spend later. It practically pays for itself! The sun is hot, the water is fine, and there’s only a hint of radioactive material blowing on the ocean breeze. Jump on in and see what there is to discover here in New California! Order your copy of New California (ZX03) through the Fantasy Flight Games website here!